Much like our other EAZ MAG Writer systems, this EYFS version has been designed with the sole ethos of minimal input/maximum output. We wanted to design a simple system whereby the user enters their assessment data once and then the system automatically generates various graphs, spreadsheets, learning journeys, trackers, etc at the click of a button. This online system has been specifically designed for Early Years Foundation Stage (EYFS) settings such as Childrens Centres, Nurseries, Infant Schools and Primary Schools to cover children between 0 - 5 years. 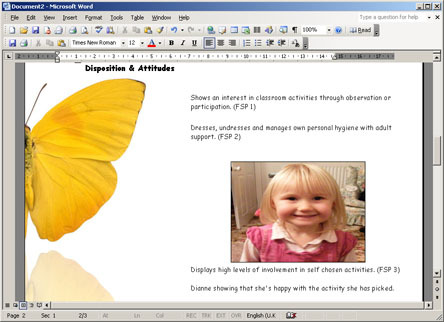 To accommodate the new 2012-13 EYFS curriculum, as outlined by the Dame Tickell review, the system is designed to be used by all EYFS teachers/practitioners wishing to dynamically store and view FSP (profile) and Development Matters (ages and stages) assessment data, eg individual statements, pictures, comments, observations, etc, in one place. 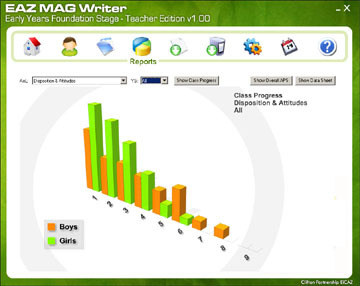 The Senior Management aspect allows school senior management teams to automatically collate the EYFS data on a whole school basis and then produce analytical data across wider groups of children. 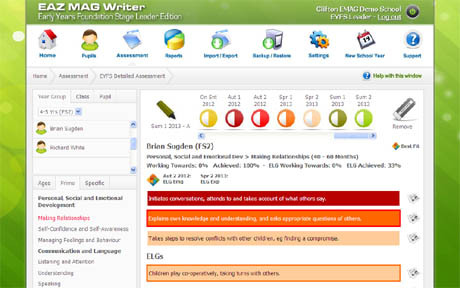 As a special introductory offer to all schools/settings, we are supplying the EAZ MAG Writer - EYFS Edition system with initial setup support at a special discounted price if purchased as a standalone system or if purchased with our EAZ MAG Writer – Primary Edition.